I love checking things off a list. I even work best under pressure with a lot of moving parts to a project. I love complex problems, and I especially love solving them. There are definitely times when I don’t get everything on my to-do list done (actually most days, if we’re honest!). I drop the ball a lot. I lose motivation in the mundane of life. I forget to make dinner. In other words, even though I can get things done, I’m far from perfect! 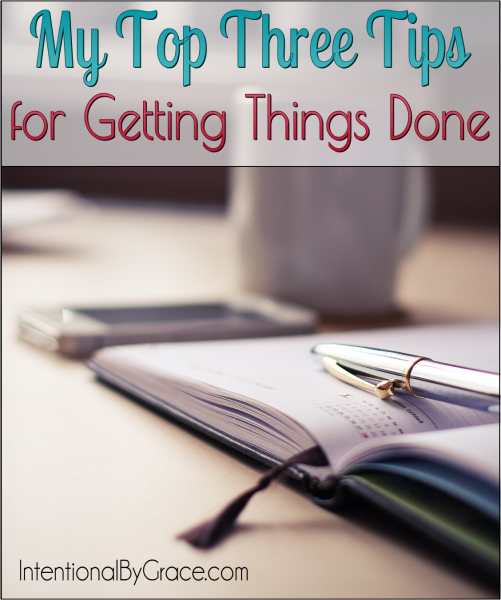 Today I want to share my top three tips for getting things done because it’s a question I get asked so often! I believe in making a prioritized list each day. A prioritized list is no ordinary list. It’s a list made with intention. 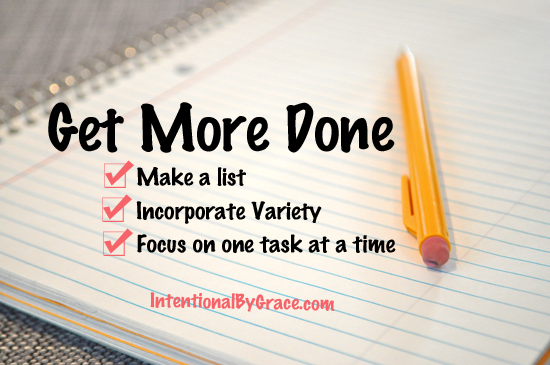 I teach you how to make a prioritized list that actually works in my eCourse, Intentional By Grace Unplugged. By prioritizing my list, it ensures that I am working on the right tasks at the right time throughout the day. Plus a prioritized list means you keep your list short. Making a list helps you to stay on task and get things done more quickly! I don’t know about you, but I have a hard time staying motivated. Some days I wake up ready to tackle the day, but most days I’m exhausted and just don’t feel like going through the motions. Therefore, I’ve found that by incorporating a variety of tasks into my day helps me get more done because it keeps things interesting. For example, after I go through my morning routine, I sit down and play with my kids for a bit. If I’ve been writing for a while, then I will change over to Pinterest and pin a few posts. If I’ve been doing laundry tasks, then I’ll head outside to weed the garden. I cannot stay on the same tasks, especially the ones I don’t particularly like, for long periods of time. So when I make my list, I make sure I’m alternating tasks throughout the day so I don’t get bogged down in the same sort of task over and over. As women, we pride ourselves on our ability to multitask. I get it. I love multitasking too. However, focusing on one thing at a time helps me get more done! If I’m sitting down to write, then I close all the tabs on the computer and just write. 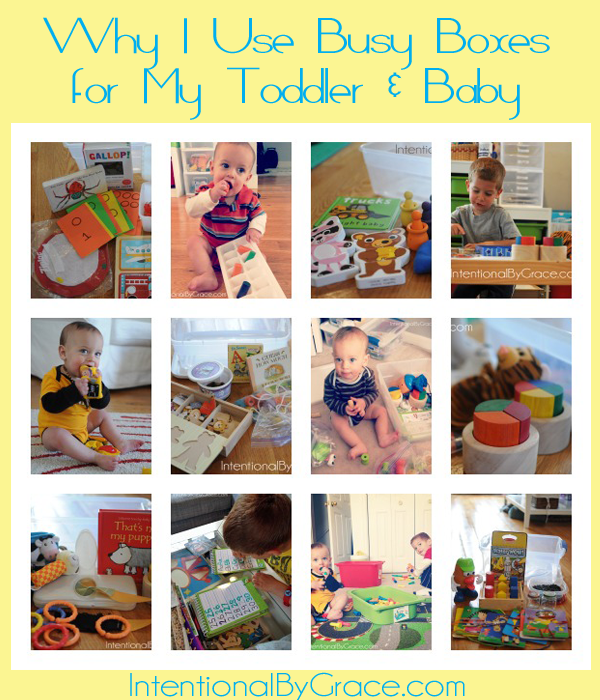 If I’m working on my menu plan, then I’m not going to try to do preschool at the same time. If I’m cooking dinner, then I’m not going to mop the kitchen floor at the same time. Of course, there are tasks that are easily put together like listening to podcasts while folding laundry. Dancing to the music with your children while making dinner. I’m not saying never multitask. I’m just saying if you truly want to get more done, then consider only focusing on that one task. Get it done, then move on to something else. I’m sure y’all have even more tips for getting things done! Share them with me in the comments! We are doing a study in church right now about Margin. The part that really sticks out to me is stepping away from trying to do so much at one time that I am not focusing 100% on the important task at that moment. I am trying really hard to undo multitasking and focus on 1 thing, like my 19mo old doing colors or letters, working on organizational newsletter, or creating my dinner menu for the week. This is hard to do. Thank you for the blog! The only thing I will multitask is the laundry (1 load ONLY) and my computer correspondence. I can hear the machines running, and it is a defined amount of time.